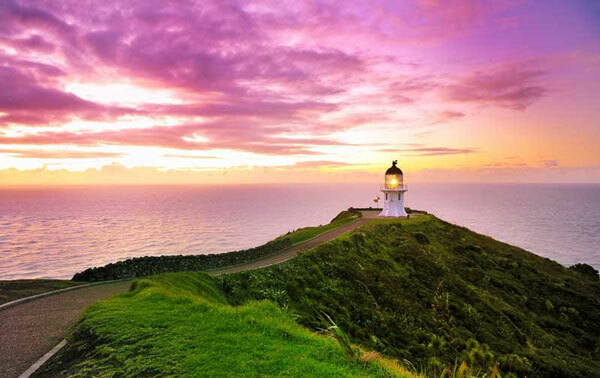 Cape Reinga is a very sacred place to Maori; it is the place where the spirits of the dead depart the mainland on their way to their ancestral homeland of Hawaiki. It is also very popular with tourists with approximately 120,000 visitors per year and about 1300 cars per day (during the peak season). It is a very beautiful spot and is located at the northern end of the North Island of New Zealand. It is about a 3 hour drive from Kerikeri, and about 1.5 hours from Kaitaia. The road is sealed all the way but care must be taken during the summer months as it can be quite a busy road. The walk from the carpark to the lighthouse is easy and is only about 300 meters long. View the Tasman Sea and the Pacific Ocean collide with immense power producing spectacular swirls to churning waves as the two currents hit each other with amazing force. To get here just jump onto State Highway 1 and travel north, at the end of the road is the carpark for the Lighthouse. That’s it really, the simplest directions you will ever have.